There's a lot to get excited about this week. Choir of Young Believers has already gotten a bunch of good buzz, a new record from Counting Crows came as a complete surprise, and MoMA's Kraftwerk box set is sure to please a lot of people who couldn't get tickets to their New York shows. And that's not enough beginning to scratch the surface. 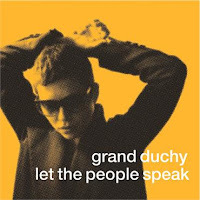 There's also plenty of reissues from Opeth, long-awaited self-titled albums from Scars on 45 and Lissy Trullie, and a new record from Black Francis's Grand Duchy (pictured). If we missed mentioning anything, we're sure that we've got it covered in the list below. 04/10/12 The Creepy Crawlies Get Buried!